No sooner does Mária start work as the new quality controller at a slaughterhouse in Budapest than the whispers begin. At lunch, the young woman always chooses a table on her own in the sterile canteen where she sits in silence. She takes her job seriously and adheres strictly to the rules, deducting penalty points for every excessive ounce of fat. Hers is a world that consists of figures and data that have imprinted themselves on her memory since early childhood. Her slightly older boss Endre is also the quiet type. Tentatively, they begin to get to know each other. Recognising their spiritual kinship, they are amazed to discover that they even have the same dreams at night, in which they meet as deer in a forest and fall in love. Carefully, they attempt to make them come true. 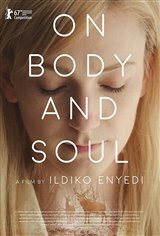 This story of two people discovering the realm of emotions and physical desire, at first individually and then together, is tenderly told by director Ildikó Enyedi, but in a way that also exudes subtle humor. A film about the fears and inhibitions associated with opening up to others, and about how exhilarating it can be when you finally do.